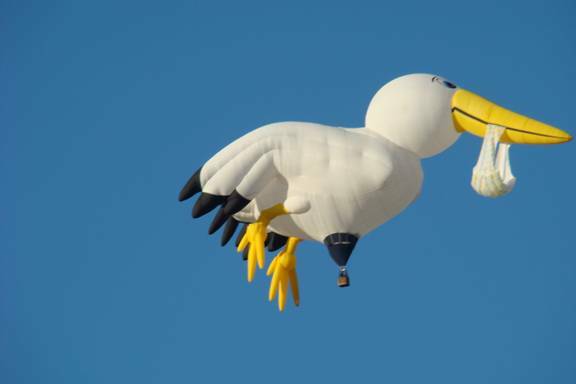 This stork is actually owned by a gynaecologist. What more proof do you need? Scientific Storkism is confirmed by direct observation (J.P. Jekowski, personal observation, above), and by a rapidly expanding scientific literature (see also Stein et al. ), although Dawkins dismisses the theory in his usual militant closed-minded manner. Birth congratulations cards from all over the world show of storks carrying fully developed human children (in East Asia, they are replaced, appropriately enough, by their close relatives the cranes), and the actual process of delivery by stork has even been captured on film by Brazilian gynecologists, as also by Disney in his 1941 zoological study, Dumbo. Millions of parents prefer to offer their children stork-only education. Thus the compulsory teaching of UDT in schools undermines the family, which is the basis of all morality. (Scotland, I am proud to say, gives parents the right to withdraw their children from Relationships, sexual health and parenthood education, which includes UDT). We should never forget that UDT claims to be a scientific theory. 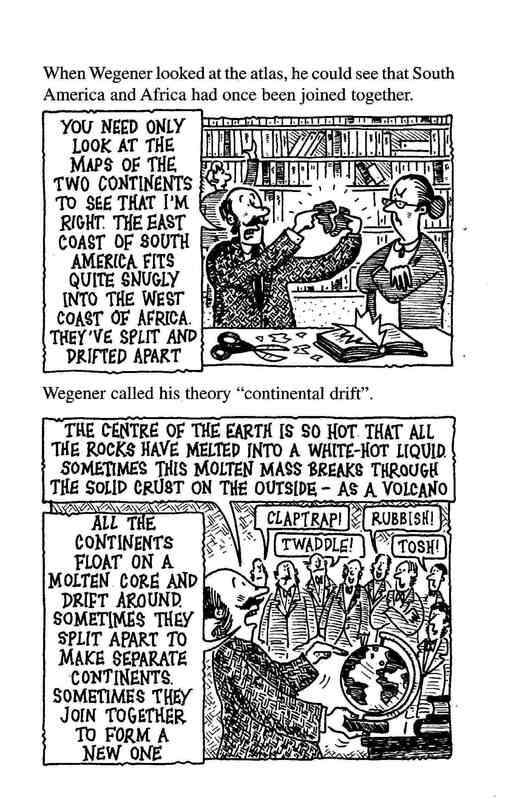 But according to Popper, a scientific theory is always open to being disproved by further evidence, so we should never teach it to students as if it were proven fact. Despite numerous claims to the contrary, no one has ever actually seen the development of a baby in a uterus. There are a large number of images of what supporters of the theory claim are different stages of development, but all of these fall into one of two classes. Either there is insignificant change between successive images (microdevelopment, which is not in dispute), or there is significant change between successive images (in which case there are Missing Links). 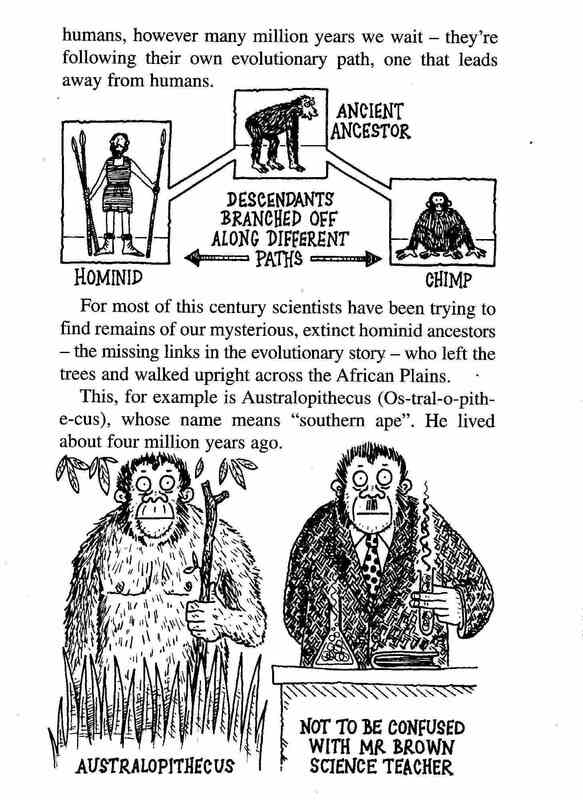 Besides, as Jonathan Wells argues (Icons of Evolution, Ch. 5; this book now comes with its own study guide), Haeckel’s 1874 sketches of embryos were misdrawn, which proves that we cannot trust the scientists who claim evidence for uterine development. UDT postulates the existence of a disposable organ known as the placenta. A little bit of calculation shows that if the theory is true, and if we modestly estimate the number of human babies delivered to date as ten billion, enough placentas must by now have been generated to cover the entire State of Texas with placentas to a depth of 20 feet. But the State of Texas is not covered with placentas at all. This alone should conclusively refute the theory. The UDT theory also requires that the process be initiated by a procedure so grotesque that it can only be the product of a diseased imagination. Do we really want people with diseased imaginations deciding what is taught in our schools? Finally we have the mathematical argument in favor of Storkism (casual readers may if they wish omit this part). Consider Mrs Smith living next to Mrs Jones and Mrs Robinson. Invariably, Mrs Smith’s baby will be born to Mrs Smith. The probability of this happening by chance os only 1 in 3. Then Mrs Jones gives birth to her own baby, not Mrs Robinson’s; probability 1 in 2, for an overall probability of 1 in 6. This is not an inherent property of Smithness or Jonesness; as it happens, both Mrs Smith and Mrs Jones have given birth to Mr Robinson’s baby. Clearly, a sophisticated selection process is at work. How sophisticated? Consider a set of only 20 separate mother-child pairs. Invariably, each child is paired with the correct mother. Extending our earlier calculation shows that under UDT the probability of this happening by chance is no more than one in 20 Factorial, or 1 in 2,432,902,008,176,640,000. Considering real populations, the odds become hyperastronomical, and even 100 families suffice to take us beyond Dembski’s 1 in 10^150 ultimate probability limit. Under Storkism, this apparently insuperable problem is immediately solved by the intervention of ID, or Intelligent Delivery. Intelligent Delivery is the only known effective means to achieve such a feat, as demonstrated daily by the operations of the Postal Service, and Occam’s Razor shows on philosophical grounds that no other process is necessary. As Alastair Noble of Glasgow’s Centre for Intelligent Delivery has pointed out, we know of only two cases of such improbable specificity. One is child delivery, and the other one is mail delivery. But we know that mail delivery shows the operation of an intelligence, and therefore reduction to best explanation requires us to say the same of child delivery. The case is completely analogous to that of biological complexity, in which each protein has its own protein sequence and not a different one. We thank the Delivery Institute’s Center for Science and Culture for unprecedented insights, and J.P. Jekowski for the pictorial evidence presented. An earlier version of this post appeared here. An alert reader has pointed out that this link no longer exists. Clear evidence of uterine developmentalists suppressing contrary opinion. This is exactly what Wells argues. The first 50,000; what next? Not much by some standards, I know, but still gratifying, especially as 33,000 of these have been in 2014. Actually, I’m a little out of date and we’ve now passed 52,500, but I’ve been busy with other stuff, such as the Law Society’s ill-judged decision to advise on sharia law which I discussed over at 3 Quarks Daily (see also here), and the secularist case for an independent Scotland, given the deep entrenchment of religious privilege in what I look forward to referring to as the Former United Kingdom. My thanks to all who have helped me reach this point. Friends who have commented, shown appreciation, mentioned this blog, retweeted, reposted, invited me to guest post, or mentioned me in their own publications – you know who you are and what you’ve done, and I appreciate it. 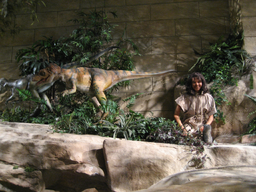 My thanks also to my creationist opponents who have struggled – so far unsuccessfully – to show me the error of my ways. But above all, my thanks to my readers. 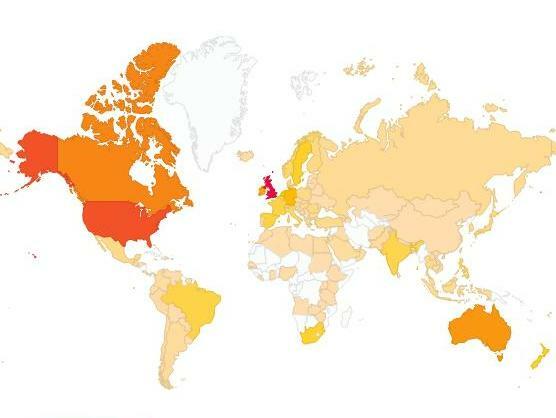 Readers from over 140 countries and autonomous regions. Russian Federation and Ukraine. Israel and Palestine. Most populous, China (yes, I have had views direct from there, and one from Macau, as well as a number from Hong Kong). Least populous, Aland Islands in the Baltic, followed by Gibraltar and the Faroe Islands. All 28 member states of the EU. Except for Yemen and Syria, every Arabic-speaking country. Every other country with a Mediterranean coastline except Monaco. All the successor states to Yugoslavia and 12 out of 15 successor states to the Soviet Union. Most remote, Nepal, Kyrgyzstan, and Mongolia. Most gratifying, Rwanda, Burundi, and Afghanistan. Most heavily represented, UK followed by US, with Canada and Australia some way behind but still over the thousand mark. Most conspicuous absentee, Iran. Most read topics, evolution and creationism. Hardly surprising; this was not what I intended, but I’ve found myself writing about little else. Heavy emphasis on the situation in Scotland, because that’s where I live and where my ear is to the ground. 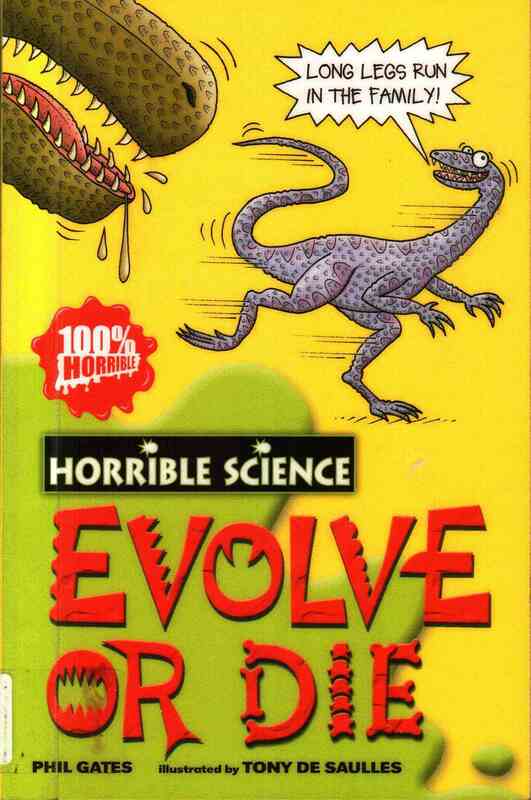 I have been horrified by the extent of creationist infiltration in Scottish education, frustrated by official evasiveness, and increasingly convinced that the campaign against obscurantism needs to be bottom up as well as top down. Pusillanimous politicians would rather forget about the matter, as would their overburdened officialdom. It is up to us to remind them, to find out what is happening case by case, to mobilise parents, to form alliances across faith and party lines, to share our awareness of how much is at stake. I hope this blog helps. If you have ideas about how best to use it, let me know. Isn’t one law enough for England’s Law Society? Update: in November 2014, under pressure of public opinion, the Law Society withdrew the offending advice note. That’s my friend Ramin Forghani from Iran, standing next to Maryam Namazie, carrying a placard outside the Law Society offices in London. He knows that what he is doing, and what he is about to say, could get him killed. Imagine that you want to write your will according to sharia law, which in England you are perfectly entitled to do. You can go to your friendly neighbourhood Imam to discuss the matter, ask him to explain what is actual law, and what mere custom, talk about the various different interpretations available), and consider how best to apply them to your own family circumstances. This could be quite a long conversation; there are at least six main traditional schools of sharia jurisprudence, to say nothing of modernisers like Musawah who seek to accommodate Islamic practice to present-day principles of equality. Even if it were the case (as it is not) that al-Jibaly’s views on sharia were beyond dispute, it is not the job of the Law Society to give out guidance in how to apply his pernicious principles. And even if the guidance were thoroughly praiseworthy, which it clearly is not, it is wrong in principle and dangerous in practice to graft any kind of religious law onto the practice of general law, which is the only role of solicitors in a secular and plural society such as ours. There is worse to come. The Law Society has an event scheduled in June, and already sold out, as a forerunner to future seminar series on Islamic law. This event will count towards solicitors’ mandatory hours of Continuous Professional Development, and will offer sharia training on family and children, among other topics. I’m here on behalf of the Scottish Secular Society. I know that the legal system in Scotland is separate from England and Wales. But I’m Iranian and I well know that what happens when the barrier between Religion and legal system gets destroyed. Iran sharia law sentences apostates like me to death and now the Law Society has written guidance for it. Secularism acknowledges religious freedom and that means keeping a distinct barrier between it and the legal system. That’s a shame that in this country which is famous for secularism, the Law Society has done guidance on sharia law, a religious system. The Law Society is not in a position to write guidance for sharia as a religious legal system. Even if it was, there is a huge debate on sharia law in Muslim countries at the moment and the Law Society has chosen the most outdated, the most reactionary version of it. Shame on them. For more background, and to join the petition to the Law Society to stop promoting discrimination, see here. The One Law for All letter to the Law Society, with list of signatories, is here. For more on the Law Society’s future plans in this area, see here. For the extremely revealing correspondence between the Law Society and Lawyers’ Secular Society, and further background, see here and links therein. Disclosure: Ramin and I are both on the board of Scottish Secular Society. An earlier version of this posting appeared on 3 Quarks Daily. Salafis are an extreme literalist sect, often identified with the Wahhabism of Saudi Arabia, who do not acknowledge or follow any of the four schools of thought to which other Sunni Muslims adhere. I’ve been attacked by the Discovery Institute’s Uncommon Descent. That’s not interesting. What’s interesting is the reason; they caught me making fun of Young Earth creationism. For saying this, I would expect criticism from openly creationist sources such as Answers in Genesis or Creation Ministries International. But Uncommon Descent isn’t supposed to be like that. It claims, as you can see, to serve the Intelligent Design community. This is not supposed to be creationist, and I have seen the Director of the Centre for Intelligent Design, the Discovery Institute’s UK franchise, go red in the face denying that creationism and Intelligent Design have anything to do with each other. Others have drawn attention to the Discovery Institute’s cries of “gagging order” when Ball State University stopped the teaching of theocentric Intelligent Design as science, and their support for the Bryan University administration as merely asserting its rights when it suddenly demanded that their faculty members profess belief in a literal Adam and Eve. A double standard; demanding unconstitutional privilege for creationism in the name of academic freedom, while turning a blind eye when such freedom is trampled on by the creationists themselves. Remember that when next you hear the Discovery Institute argue for the “academic freedom” to teach creationism in publicly funded schools. 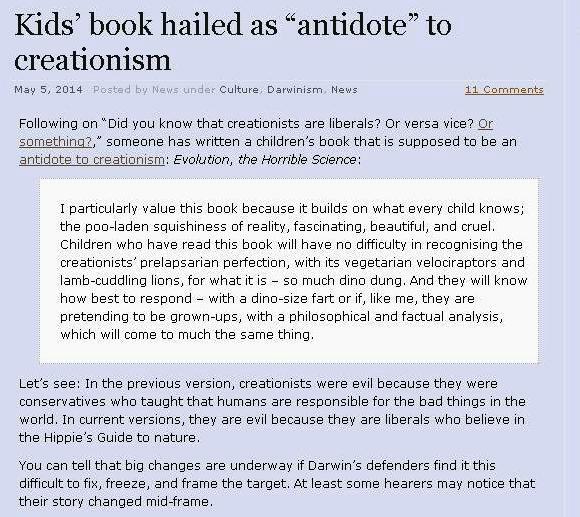 And just to spell it out, they describe my review of a 5 year old book as part of the latest attack on the poor beleaguered creationists, because I scurrilously refer to what creationists believe, thereby unfairly accusing them of being “liberals who believe in the Hippie’s [sic] Guide to nature”. And the interesting bit is, not the boring banality and involuted illogic of Uncommon Descent, which is standard, but the fact that they think their job includes defending Young Earth creationists. One final detail. I am not a defender of Darwin, just as when I talk about the chemical elements I am not a defender of Lavoisier, or when I invoke classical mechanics I am not a defender of Newton. Physics, chemistry, and biology are very different from what they were in the 17th, 18th, and 19th Centuries respectively, even if the creationists Intelligent Designers refuse to notice. Technical note: I use HTML nofollow for links to DI and other creationist sites, so as not to boost their click counts and advertising revenues. They even muddle up the title of my review with that of the book I was reviewing.